About 2 months and no blog posts, sheesh, the next few posts will be playing catch up. The 85 model year and newer vanagons have a much improved sliding door. Easier operating and a bit quieter than the old style but I thought it could be even better. 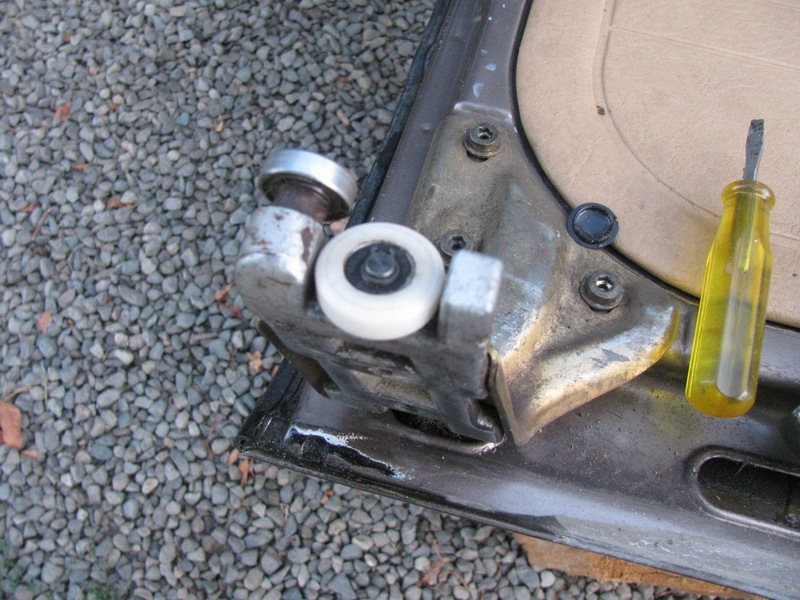 I had tried UHMW polyethylene tape on the surfaces that the rollers ran on would be the ticket, blog post about that here. But the tape wore out after a year and a bit. So i thought about a plastic version of the steel rollers. I made a quick and dirty prototype from some Delrin to try on the middle track (the track under the cover on the side of the van). Not quite an exact copy and a bit out of focus. Here it is installed. Verdict? Well it is quieter than the steel roller and it rolls just as easily. But with that track silenced a little, now I could hear the lower track roller noise. So some time later I set about making another middle slider roller and seeing what I could do about the lower track roller. Middle roller, more care taken. 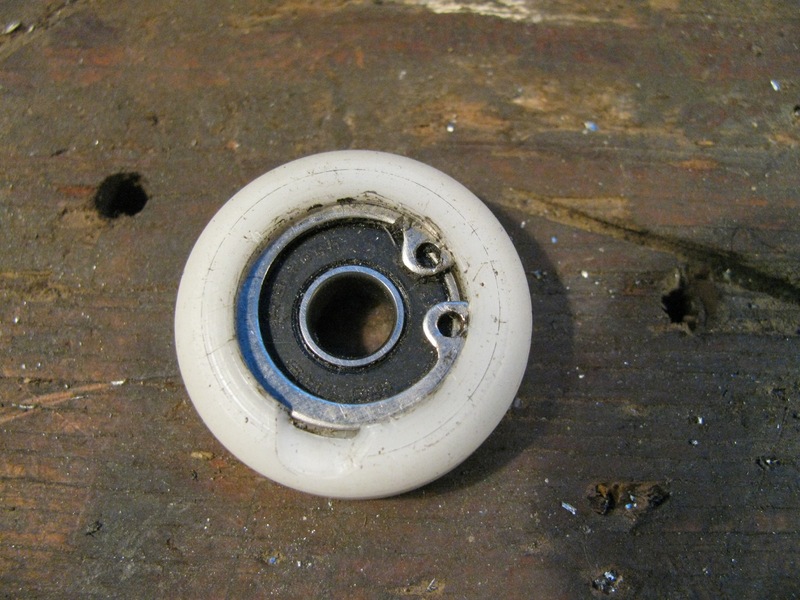 Oh, I should mention that the bearing used in the roller is a 607RS. Dimensions are 19mm OD, 7mm ID, 6 mm thick, and rubber shield. I took the sliding door right off as I was working on the lower roller at the same time. Here is the stock steel roller. And my Delrin version installed. 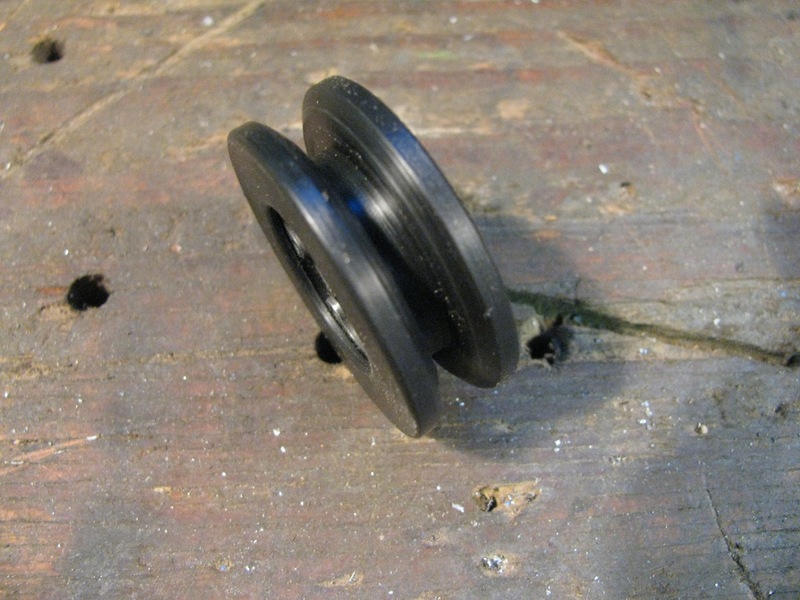 See the 2 other bearing above the plastic roller? They run in a vertical channel above the rail the main roller runs on. I didn’t do anything with them, but i probably should have thought about it. I was going to make a lower track roller from scratch but I found a plastic roller in my junk pile. I think it was from a hanging door, but I can’t remember anything more about it. I wish I did because it is very close to the stock roller dimensions. 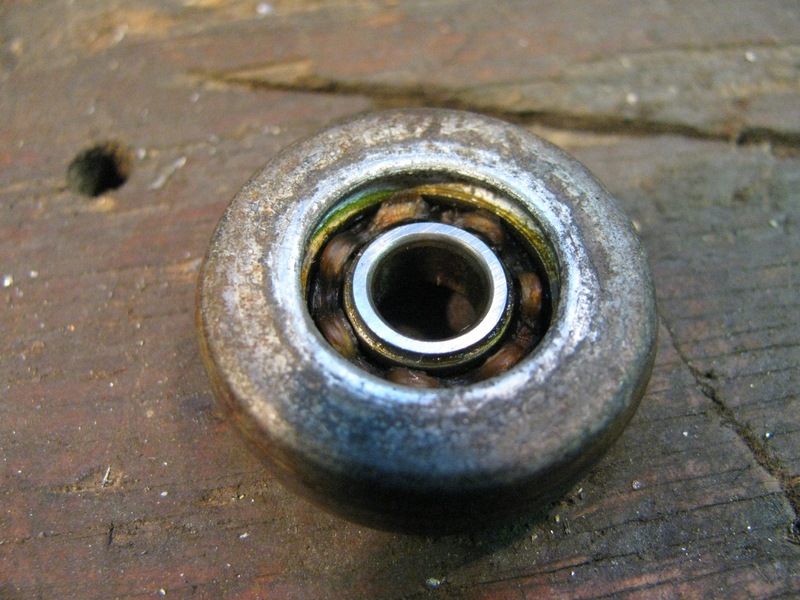 I just had to reduce the OD by a few millimetres and replace the bearing with a 607RS. 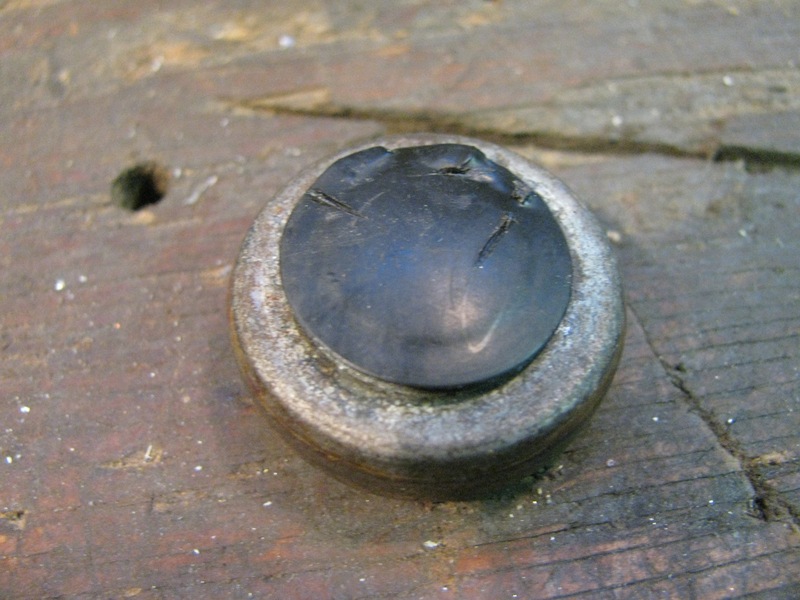 It originally had a 6mm ID bearing. 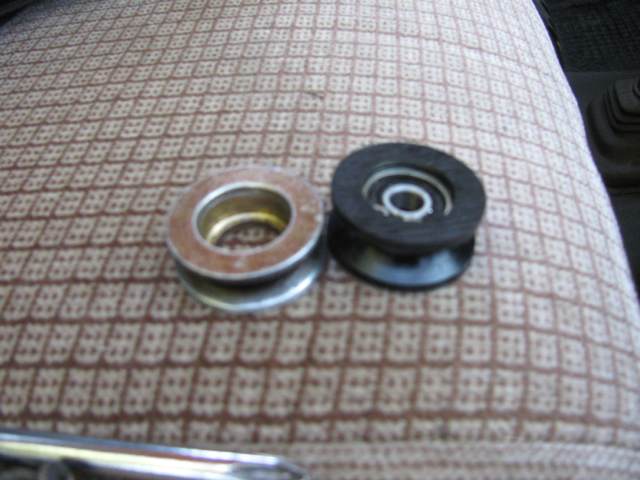 The circlip retaining the bearing was a real bear to remove and I accidentally broke a little of the plastic. here is the stock steel roller. 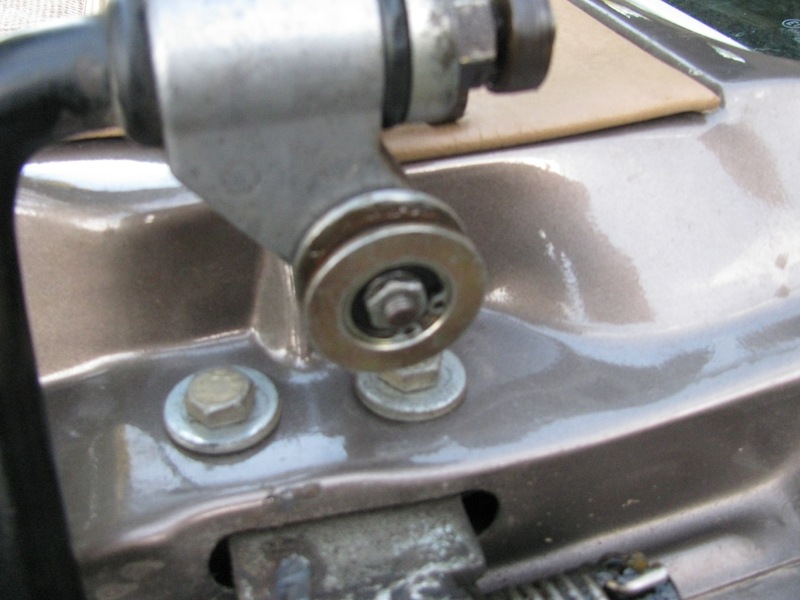 The roller is on a post on the lower assembly , secured by a circlip. 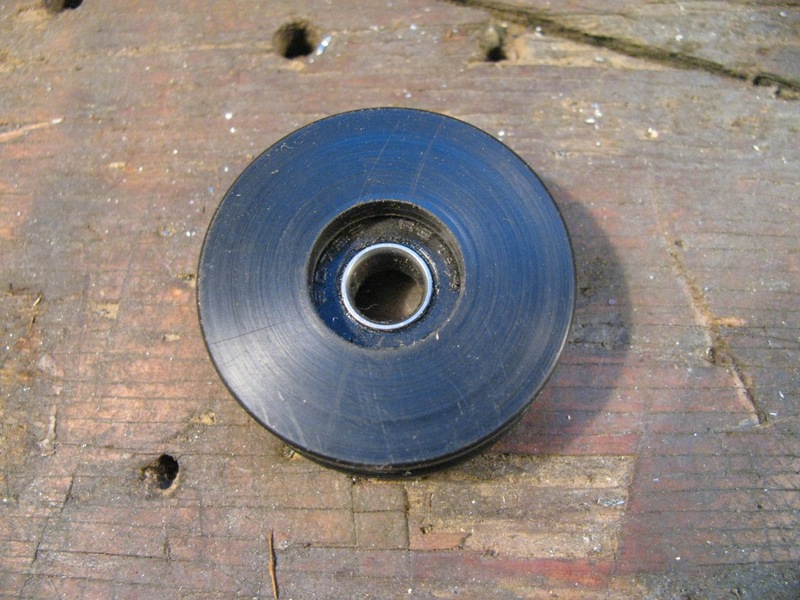 The plastic shield can be pried off and the clip removed and the roller pulled from the shaft. 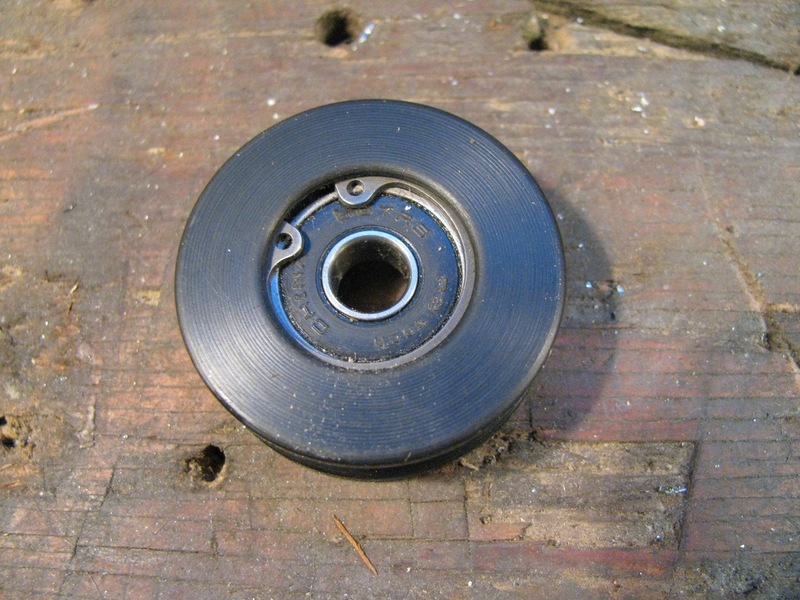 This is not a roller with a pressed in bearing, the bearing and the roller are all one piece. Has a rubber shield on the inside, the bracket side, face. 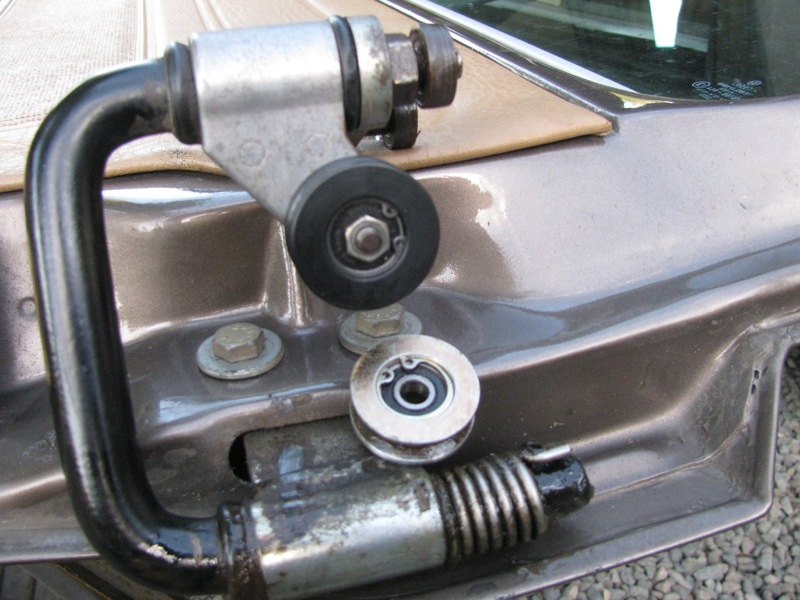 Comparison of the stock roller and the hanging door roller. Both have somewhat similar profiles. Close enough for me anyway. But as I mentioned before, I had to turn down the OD of the plastic roller. And showing where I broke the darned thing. And there it is installed on the door bracket. So did it make a difference? Yes, it did. Again quieter and smoother. The door still is not as quiet as I would like and I think some of the noise is coming from those vertical bearings on the middle slider, the pair I should have paid more attention to. You know, this is the kind of project that 99.9% of people would look at and shake their heads, mutter “get a life” and then wander off to chat with someone else. It is only when i sit down and write this post does that realization sink in. Crikey, forgot to add an important thing… to thank “ZsZ” for posting measured drawings on this Samba thread. I’ll be cheeky and link directly to the drawing. 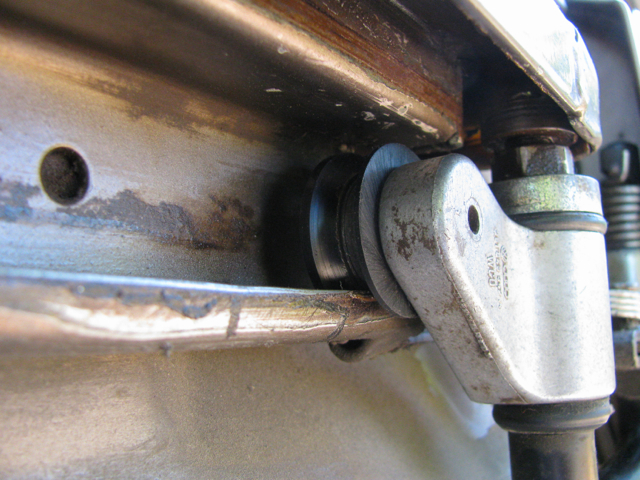 This entry was posted on September 8, 2014, 4:46 pm and is filed under vanagon, vanagon mods. You can follow any responses to this entry through RSS 2.0. You can leave a response, or trackback from your own site. Our door seems to be quiet (reworked everything when we got the van) but I have nothing to compare with….. Thanks for posting all information and drawing. We are still under the high pressure ridge that has dominated our weather more or less since the beginning of July. Long range forecast is for the weather to remain fine through September. I chuckled when I saw the reports of snow in Alberta. Nice! 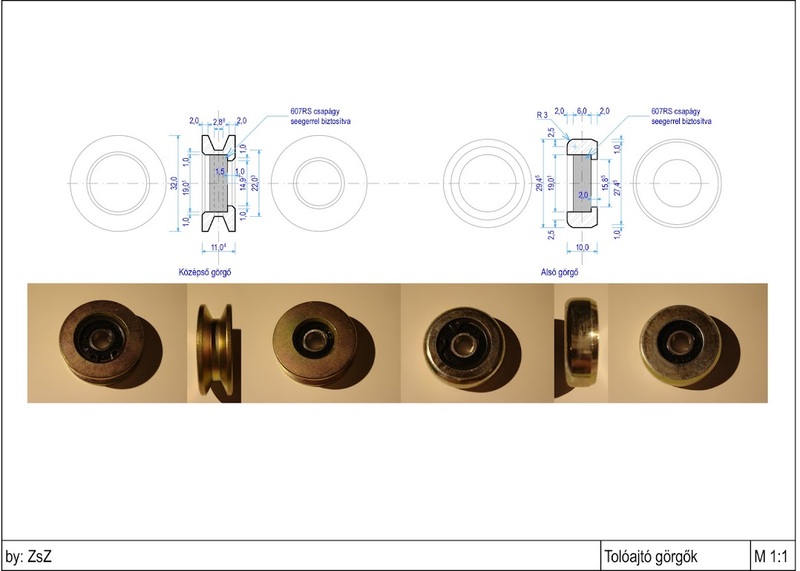 I made the drawings to ask my father to make some delrin rollers for me, in hope that they are more silent than the new metal ones. After your post I definitely will ask him. I thank you for the drawings, not only did it save me time in measuring the stock rollers but they gave me the impetus I needed to do the project. One thing you left out is the circlip groove. What I did was grind a tool bit to cut the groove, but I did not grind it as thin as the circlip. I was afraid that the tool bit would be too weak, mind you I was only cutting delrin so that concern might have been for nothing. 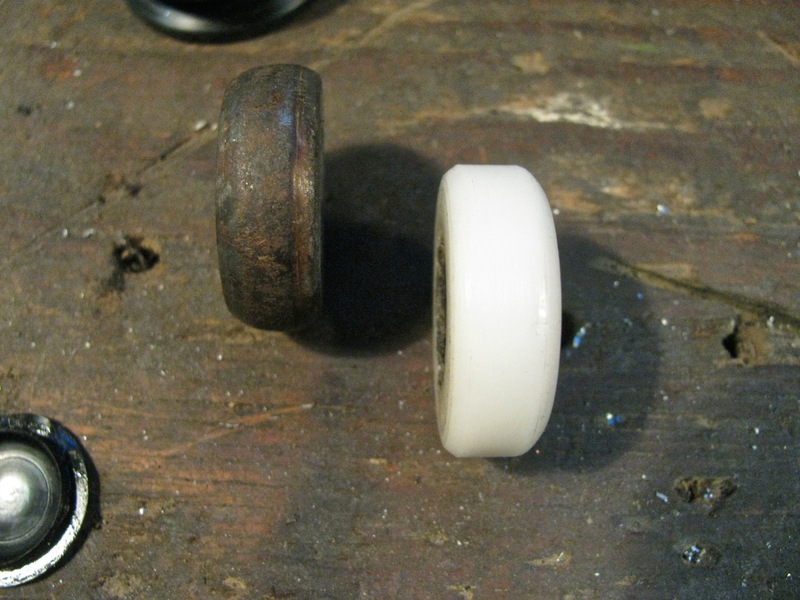 So I cut the “oversized” groove at a distance in from the end of the roller so that part of the groove would be covered by the bearing and the exposed part of the groove would be the correct width for the clip. Yes, as I wrote on samba, I forgot to measure the circlip groove, but I tought that a latheman in a shop knows what groove the circlip needs (my father has qualification as an engine fitter technician, so he knows this type of standards). Since that I built them in so I cannot measure, but I think the groove is about around 0.7 to 1 milimeter deep and just a bit wider than the circlip. Sorry, I missed your samba note about the groove, my apologies. I can’t recall the thickness of the clip is used, I bought a 3/4″ clip at local auto parts store ( no metric but 3/4″ very close). Maybe the metric sizes are not good for an US/Imperial sized circlip, so it is better to use the dimensions of the circlip you can get the shelf off. Yes, cutting the groove to fit the clip is the way to go. Btw, did you look at the vertical rollers on the middle slider? I mentioned in the post that I think some noise comes from them. 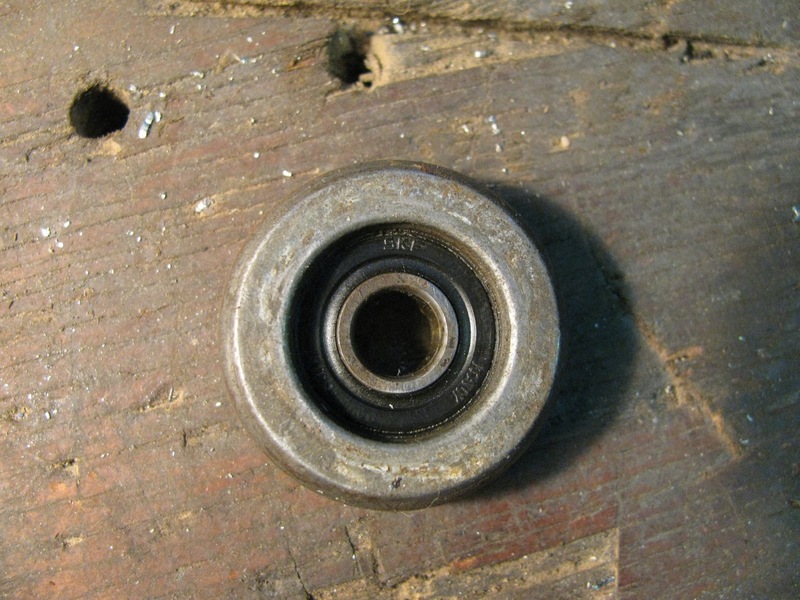 They appear to be straight bearings, no roller. I might pull the door again and look at me to see if they can be covered to reduce the steel on steel noise. 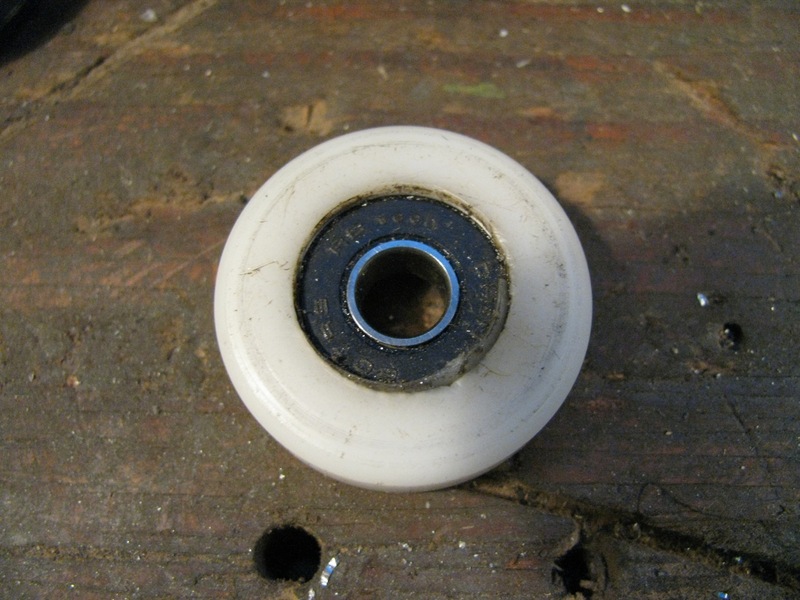 Yes, They are simple bearings. I don’t remember the size, but they are all the same type. There is very small space beside them in the grooves they are running in, maybe 1 mm or 2 so no thick cover can be used. Maybe some heavy duty heat shrink tube can solve this problem. I didn’t realize that those vertical bearings were so tight in there. That makes covering them more of a challenge. Maybe it would be possible to turn delrin caps for them. What inducement would it take for you to make another set? Maybe a hard to find part that you have been looking for, money, cookies, slave labor? Hey Dan, I’m not completely reluctant to make a few up, I’m just kinda pressed for time. That being said im thinking of making a few difference vanagon parts and selling them. Don’t hold your breath though, but I will post something in my blog if I gdO ahead.